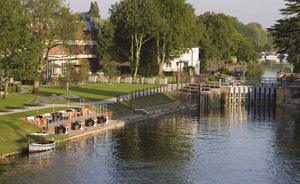 The Royal River Thames offers a superb backdrop for any meeting or conference, however large or small. With heritage locations of Windsor and Oxford, international events such as Henley Regatta and Ascot and the setting for the Olympic rowing at Dorney Lake, you are spoilt for choice. Your activity programme can include a range of team- building activities whether on land or on the water. Private Charters are great and the boats vary from smaller more exclusive ones for smaller meetings or a special event to the bigger cruise boats which can cater up to 175 delegates. The Royal River Thames outside London provides the perfect setting to celebrate or experience some of the great events such as Henley Royal Regatta. Include some entertainment in your package from jazz bands to musicians, there are endless options. For an intimate meeting, follow in the footsteps of royalty. The Ascot Room in the elegant Grade 1 Listed Windsor Guildhall was chosen by Prince Charles for his wedding civil service. Hold your meeting on the 2012 Olympic rowing finishing line in the Olympic Suite at Dorney Lake. If the exclusive use of a venue is important, there’s no finer place than Cliveden. Your own stately home for your special event for up to 120. Follow in the traditions of 800 years and host your meeting at Runnymede. The Runnymede on Thames(pictured) has created a Magna Carta Meetings Package fit for Royalty which includes the opportunity to put your ‘boss’ in the Medieval stocks or challenge your colleagues to a jousting competition. With the river as your playground there is a great choice of team-building activities. Team Activity Group offers dragon boat racing, raft building or a nautical scavenger challenge as well as land based activities and entertainment. The Royal Borough of Windsor and Maidenhead provides a perfect setting for your meetings, conferences, product launches, training and events. It’s a great location less than 30 miles from London, for all your venue needs and offers a venue finding service. You can’t get a more convenient location than the Sir Christopher Wren Hotel & Spa, as well as being on the river just below Windsor Castle, it is also situated close to Windsor railway station. If gourmet food is required, look no further than the Macdonald Compleat Angler with two award-winning restaurants and the latest venture by the Michelin-starred chef Atul Kochhar will offer diners the very best of traditional Indian cuisine in a contemporary manner. Oakley Court’s Boathouse offers the ideal venue for a meeting with a difference. With a balcony opening onto the River Thames. It offers a flexible range of options to accommodate up to 40 delegates. Combine a meeting in a 19th century river barge with some great team-building activities such as clay pigeon shooting at The Swan at Streatley. If an exclusive venue is what you are looking for, then you can’t get more exclusive than your very own island. Queen’s Eyot has been owned by Eton College since 1923, and has a beautiful clubhouse built in a classical style from cedar and pine. Salter’s Passenger boats would make a perfect venue for corporate events and conferences, combined with a visit to Oxford. Choose from Fork Buffets to Finger Buffets, Hot Menus to BBQs. The New Orleans, Hobbs of Henley’s largest and most luxurious passenger vessel is in the style of a Mississippi Sternwheeler. It has a fully enclosed elegant saloon with stylish cocktail bar and an open upper desk for viewing the stunning scenery by day or dancing under the stars at night.